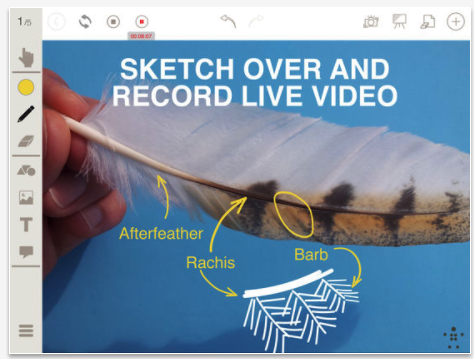 Stage Pro is a very good interactive whiteboard and document camera app that is free today and only for a limited period of time. As a teacher you can use this app to create interactive tutorials and demo videos using both the convenience of your camera and the strength of an interactive whiteboard. You can record video and audio, annotate and mark-up picture and documents, create multi-page presentations, and easily capture and share lessons. Stage Pro includes collaborative features that allow you to use live video and interactive tools to ‘ showcase real-time problem solving, demos, and experimentation. Paired with Airplay, Stage makes wireless sharing quick and easy. With the added flexibility to move around the room, educators can truly engage and involve students.’ Other interesting features provided by Stage Pro include: Easily switch backgrounds from live front/rear camera feed, whiteboard/blackboard canvas, any picture from your photo library, or royalty-free academic images; import PDFs from Dropbox, Google Drive, or “Open in…” iOS feature; lock/unlock camera autofocus to produce perfect, blur-free tutorials; dynamically present in real-time, wirelessly using Airplay or via a wired projector connection; save everything directly to your iPhone or iPad photo library for anywhere, anytime access; simple, accessible, and effective - No app login or internet connection required…Give it a try and see if you like it.